This CAD software lets you design all of the critical components for your home or in my case cottage. It includes foundations, HVAC, electrical, plumbing, custom windows, roofs, decks, and more. I can position the cottage on the hill, and plant trees all around so it can be very realistic. The neatest function is the powerful 3D graphics engine that lets you create real-time walk or fly-throughs - for a Hollywood-style voyage through your new creation! I am able to see what the inside, and outside of the cottage will look like and actually walk around and inside. This feature has turned out to be invaluable in designing the layout for the basement and making modifications to the layout of the main floor. I have already avoided a few design mistakes by using it! For such a small price it is really a must for any would be cottage builder! 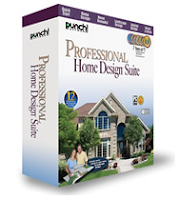 Punch has a few different CAD software packages, some less, some more expensive but I have found this one to be just right for my needs. You can find them all at www.punchsoftware.com.